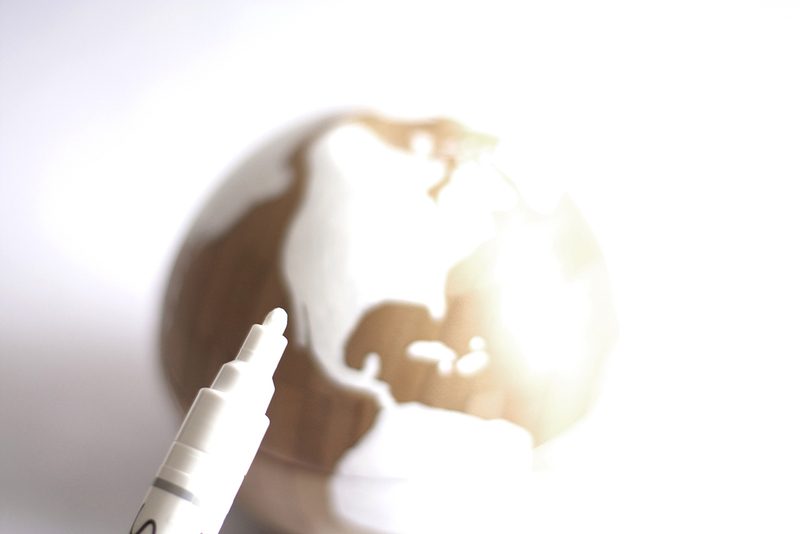 I am so excited to share this DIY Globe Home Accessory with you today. In case you hadn't noticed, I have been on a "style" posts bender. Man do I hate getting in front of the camera! I much prefer to be behind the camera, so this "home" post is a welcome change. 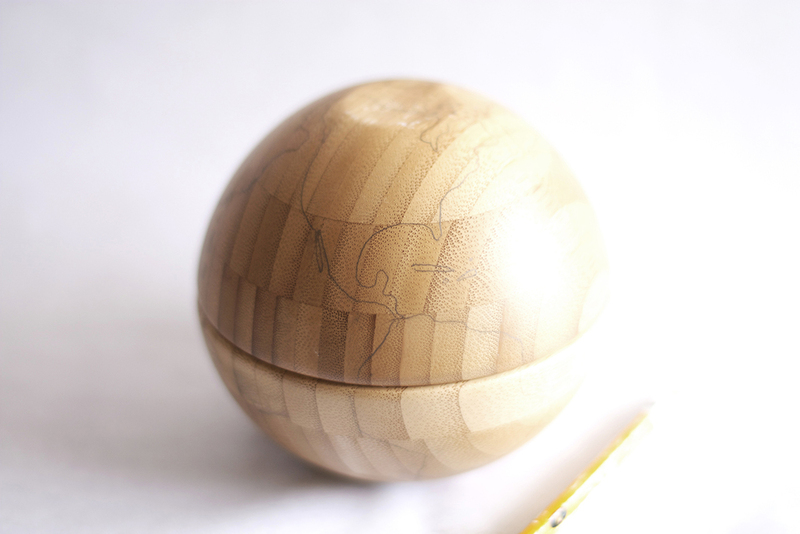 This DIY Globe is now sitting pretty on our DIY shelves. I will be sharing the full tutorial on how we did our shelves very soon. In the meantime, I've got the skinny on this globe. My favorite part of this accessory is the hinge on the back. 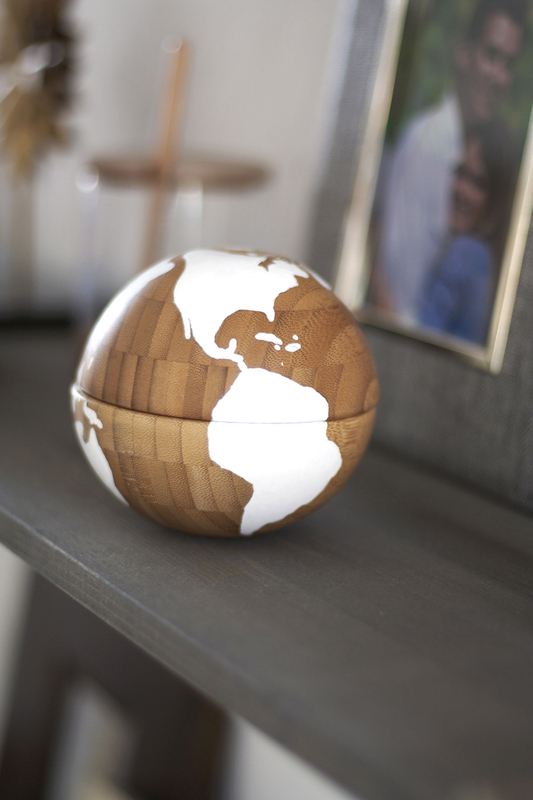 It instantly makes this globe a mini storage bin for keys, jewelry, etc. It makes a perfect catch all. 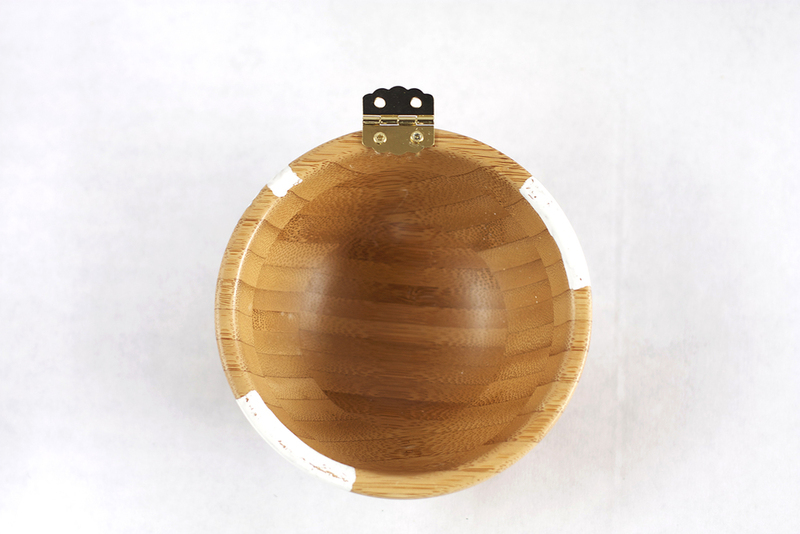 First, you will want to put the hinge on the bowls to adjoin them. Center the hinge on the rim of the bottom and top bowl. Using a very thin drill bit, drill a small hole where you will put your first screw hinge. Screw in your first screw to connect the hinge. Continue doing this until each screw is screwed in. Note you will see paint on the globe here. This is because I did the hinge last. However, it's best to start with the hinge, so you don't have to mess with lining up your continents. 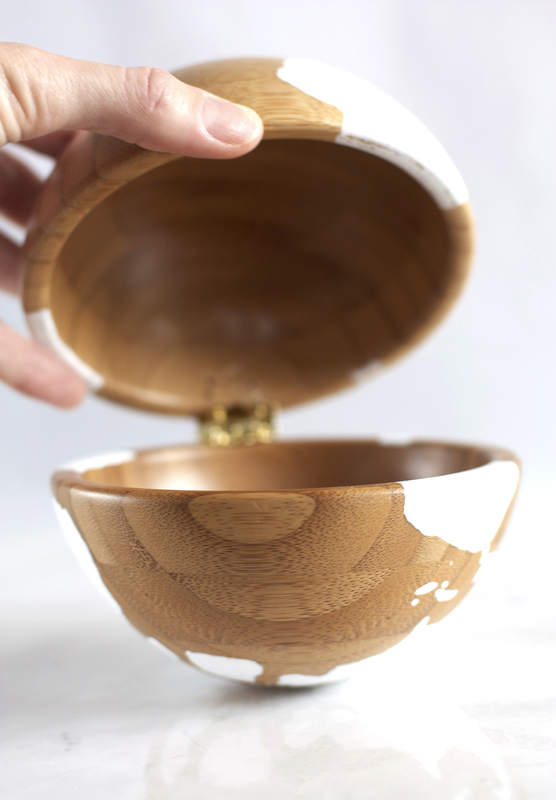 Using the internet as a guide, freehand draw the continents onto your bowls. Obvi they don't have to be perfect because you most likely aren't going to be using this globe for reference. Color in the continents with your paint pent. 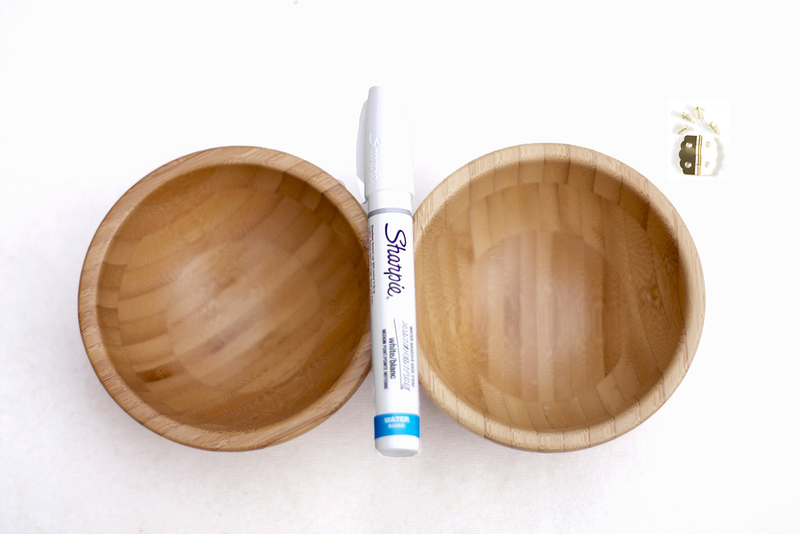 Apply 2 - 3 coats, making sure to allow the paint to dry between each coat. Make sure to paint inside the rim where the continents are shown. This will diminish the seam between the two bowls. In case you are interested, here are all of my IKEA hacks. 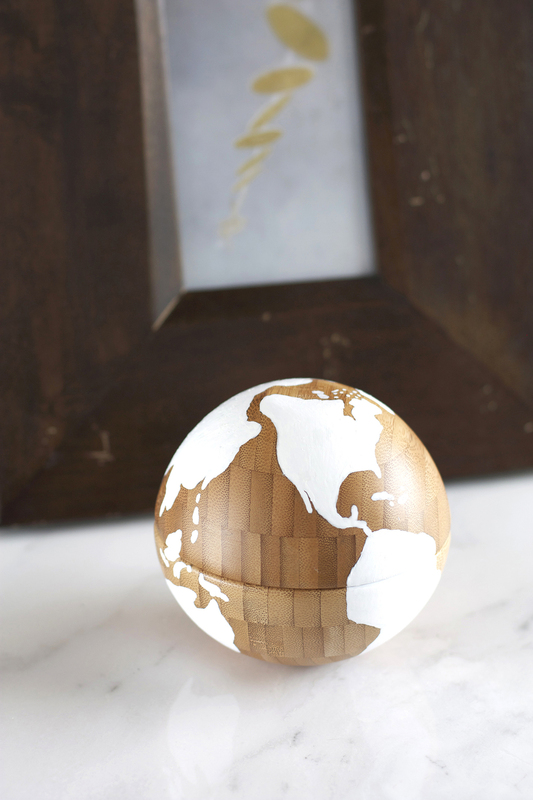 Are you digging the globe trend in home decor? If you find this post helpful, please subscribe below. Subscribers get exclusive DIYs (seriously ... DIYs that no one else gets) and a free party printable collection just for signing up!